Uncle Milton's Force Trainer II uses holograms and a device that reads certain brain waves to train any little "Star Wars" fan in the ways of the force. The hologram is projected through a tablet, and this image shows an X-Wing being pulled from the Dagobah swamp. The toy won Space.com's Space Age Award for Best High-Tech Toy at Toy Fair 2015 in New York City. Space.com's Calla Cofield works to pull an X-Wing from the Dagobah swamp as part of Uncle Milton's Force Trainer II hologram program. ThinkGeek's new phaser remote control won Space.com's pick for the Retro Future Space Age Award at Toy Fair in 2015. The phaser, based on the original design of a prop on "Star Trek," can actually be programed to control various devices around the house. Arklu's Stargazer Lottie doll won top prize for Space.com's Little Scientists Space Age Award. The doll is fun and informative at the same time, teaching young girls about famous women in astronomy through the ages. This new bag from The Coop is the perfect carrying case for any "Star Trek" fan. Based on the show's tricorder bag, this messenger tote brings science fiction down into the real world. The bag won Space.com's Space Age Award in the Sci-Fi on Earth category for 2015. The Sky Viper Video Drone is idea for a beginning drone enthusiast interested in learning how to fly a remote control drone with video capability. The drone took hope first prize in the Flying Drones Space Age Award category for 2015. 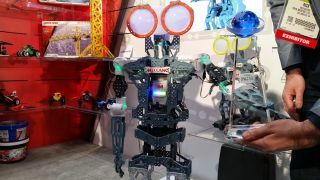 The Meccanoid robots from Spin Master are fully programmable and buildable machines that teach kids and adults how to code and work with computers. The robots can follow your movements and they're incredibly unique, making them the ideal winner for the Amazing Robots Space Age Award. Supermoon in My Room from Uncle Milton is 30 percent larger than the original Moon in My Room and it automatically can synch up with the phases of the moon outside. The toy is seen here in its "eclipse" setting, where it resembles a solar eclipse. Supermoon in My Room won the Space Age Award for Cosmic Space toy. Thames & Kosmos' Remote Control Machines: Space Explorers lets kids build their very own rover modeled after a robot on Mars. The kit also comes with a lot of educational information about Mars exploration. The toy won Space.com's Space Age Award for Do-it-Yourself Science at Toy Fair 2015.